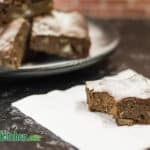 This Sugar-Free, Flourless, Gluten-Free, Low Carb Brownies recipe is loaded with chocolate and delicious macadamia nuts. It contains no grain flours or meals at all! Rich and Chewy. Line an 8in square baking pan with parchment paper. Add the chocolate and butter into a heatproof bowl. Place the bowl over a small saucepan of simmering water and gently stir until all the chocolate has melted. Remove from the heat and add the erythritol and baking powder. Add the macadamia nuts and mix through. Pour the mixture into the baking pan and smooth out. Bake for 15-20 minutes until an inserted skewer comes out clean. Leave to cool for 20 minutes before cutting into 16 pieces. Enjoy warm or place in the fridge for an extra fudgy brownie.